St. Clair County was created from Shelby County by the Alabama Territorial legislature on November 20, 1818. On December 20, 1820 a part of the county was added to Jefferson County. St. Clair County was named for General Arthur St. Clair of Pennsylvania, a hero of the American Revolution. St. Clair County is located in the north-central part of the state, and bordered by Blount, Calhoun, Talladega, Shelby, and Jefferson counties. St. Clair is the only county in Alabama to have two county seats. Ashville, originally called St. Clairsville, was named for John Ash, a senator in the state’s first General Assembly. Located in the northern part of the county, Ashville served as the county seat from 1821-1907. The Alabama Constitution of 1901 provided for Pell City in the southern part of the county to serve as the county seat for the Southern Judicial District of the county. A constitutional amendment in 1907 established Pell City, named for George H. Pell, an early settler, as the second county seat. Genealogical Society. Content modified for better readability. St. Clair County, Alabama Wiki – on FamilySearch.org. 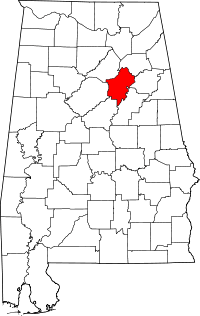 St. Clair County, Alabama – on RootsWeb listing various county sites submitted to this site. St. Clair County, Alabama – on Genealogy, Inc. that includes info on how to request information from St. Clair county & courthouse records. Message Board for St Clair County, Alabama – a free Ancestry.com site. Read & post messages about your ancestors in St Clair County. List of St. Clair County Cemeteries – List also shows town or closest town to the cemetery. St. Clair County Archives page – Lists which newspapers, probate records, and books that are available for research. US Gen Web Archives for St. Clair – Military page. ~ St. Clair County Page Maintainer: Kathy Burttram.